When I was married in the early 80’s, the most common type of wedding gown preservation was to vacuum pack it in a box. This was to protect the wedding from oxygen, the supposed enemy of the gown. It was an expensive process, and my husband and I were starving students on a shoe string budget, so my wedding dress hung in my closet, without even a plastic cover for it. Being a skilled seamstress, I had sewn my own wedding gown and so I did not have the garment bag that bridal shops provide you with the purchase of a gown. Each time I saw my dress hanging in the closet I felt a twinge of guilt. I believed I was putting the gown at risk, not having it vacuum packed. And yet, over time, I forgot about my dress, and it remained in its spot in the closet. We moved several times and the dress went with all the other clothes during each move. In 1994 I was approached by a friend who asked that I assist her with wedding gown preservation. She told me about a new method of bridal gown preservation designed by textile preservation experts. She explained to me that the vacuum packing that had been the rage in the 80’s was the worst thing that could be done to a gown! When the gown was vacuum packed, and all the air was sucked out of the box, it left the gown shriveled up. Later, when the box was opened, the gown was a mess! Each place that the gown had been creased was now permanently creased. Sometimes the dress came out in shreds. 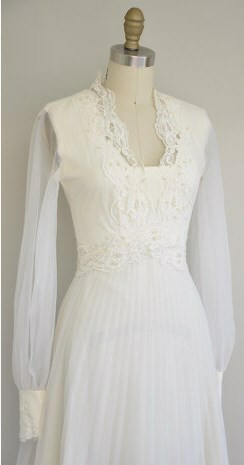 When I took my wedding dress out of its spot in the closet to preserve it, I found that it looked pretty good. It hadn’t yellowed. I discovered that oxygen hadn’t ruined it after all! It was a little dusty and it did have some oxidation spots because I had never had it cleaned. The veil looked a little shabby because it had been hanging unprotected with the dress. I then cleaned and preserved my gown with Museum Method™ bridal gown preservation. This preservation method is different. It allows you to easily inspect your bridal gown any time you like. My wedding dress looks fabulous today. I know because I can easily check it, and often do. It is protected from dust and light by a 100% cotton wedding gown preservation bag. As it turned out, oxygen was not the enemy everyone supposed it was. Since the 1980’s, wedding gown preservation has improved tremendously. Vacuum packing is no longer commonly done. There are now several options available for bridal gown preservation. However, there are quite a few variations of these options, all claiming to be the best. It can be very confusing. How do you determine which wedding dress preservation method will truly keep your gown in the best condition?